‘Leprechaun’ To Be Remade By World Wrestling Entertainment!!! Okay, let me get this straight. 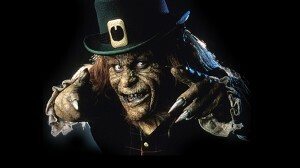 A 90’s horror film called ‘Leprechaun’ starring Warwick Davis and a young Jennifer Aniston is getting remade by the WWE? WWE meaning World Wrestling Entertainment? The same place that gave us Stone Cold Steve Austin and The Rock? From way out of left field, this is absolutely correct. So, yes, this is happening. Let’s not forget we have several ‘Leprechaun’ films already in the library including: ‘Leprechaun in the Hood’ and ‘Leprechaun: Innnnn Spaaaaaace’!!! I can’t make this stuff up. And just in time for St. Paddy’s Day. Wow. I don’t even know what to say. What would a modern day spin be like? And would they get Warwick Davis back? Or would they get their own WWE talent? I’m thinking of former WWE champ Hornswoggle. Ugghhh. This is just insane news. I was hoping for a Hellraiser reamke or that ‘Child’s Play remake I have been hearing about for years before ‘Leprechaun’, but you know what, I’ll see it. Your thoughts? This entry was posted on Friday, March 16th, 2012 at 12:12 am	and is filed under Film, News. You can follow any responses to this entry through the RSS 2.0 feed. You can skip to the end and leave a response. Pinging is currently not allowed. « The Original ‘Jurassic Park’ Will be Re-Released in 3D!! !